Just wanted to pass on a quick note to thank you for all the arrangements you made for my wife Lynn and I. We had an outstanding vacation in Ireland and all the bookings you made went off without any problems at all. Thanks also for the course recommendations. All four of them were terrific with Doonbeg being my favorite followed closely by Ballybunion Old. We added the Dromoland course while we were there and it also was great. The accommodations were first class with Dromoland Castle being the highlight. At some time in the future we plan on going back to the UK for another golf vacation and will not hesitate to contact you to make all our arrangements. 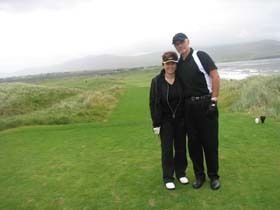 The picture I attached is of Lynn and I at Waterville.